The Mustang name was already registered in Germany but there was a strong appetite for Mustangs especially from the US Servicemen stationed there. Ford's answer was the T-5 Ford The horn button and gas caps merely said Ford. Special T-5 emblems replaced the Mustang emblems on the outside and dash of the car. The T-5 was available from 1964 to 1979. Ivy Green 1966 Mustang GT T-5 convertible that was once owned by Emmanuel Theux from Monte-Carlo. T-5 was the Mustang model sold in Germany, because the model name of "Mustang" could not be used because a trunk company had registered it first in Germany. Not sure how many people would confuse a Mustang truck with the Mustang car. This one has a K-code HiPo 289ci V8 engine. Emmanuel sold it to a private museum in Switzerland. Emmanuel has owned many Mustangs. Check them out by clicking here. Wimbledon White 1966 T-5 GT convertible owned by Chris Wold from Edgerton, Wisconsin. This is an original color convertible with the 289ci K-code Hi-Po engine with a manual transmission. Chris adds, "This car was handed to me by a previous owner who didn't have time for it. I have been showing this car at shows because of its rarity. It's was sold thru through the military PX system, shipped from the US to Europe, and sent back when a soldier was done with there tour of duty. It's been with me for a year and a half and has won best of show, best of class, and also a Facebook page. " This is a rare Silver Blue 1966 T-5 Ford fastback with a blue interior. It was exported to Germany where Ford could not register the "Mustang" name for sale. 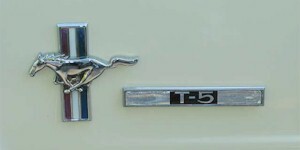 Ford replaced the "Mustang" emblems with "T-5" emblems. You also had the choice of a miles-per-hour or kilometers-per hour speedometer. These cars also came with a stiffer shock tower brace for the German autobahn. This car sold at the 2006 Barrett-Jackson Scottsdale Arizona auction for $27,000.